One of my surprise favorite anime series from last year was a short form series called Miss Monochrome: The Animation. It follows the life of Miss Monochrome, an android girl that in real life is the creation of the singer/seiyuu Yui Horie, as she tries to become an idol. It's actually pretty funny at times. Anyways, one of the jokes in the show was how damn near anything with any amount of popularity gets a Nendoroid figure in Japan. Of course since Miss Monochrome's whole schtick is that she isn't popular, she tries to create her own Nendoroid, only to fail repeatedly (Though she did create some nice things as a result). She finally did get a Nendoroid in the show, but only after dressing up as a life-sized Nendoroid. Ironically, her Nendoroid was more popular in the show than she was. True to her words, though, it was inevitable for Good Smile Company to release a Nendoroid of her in real life, and when I discovered they were making one, I just had to pre-order it. And it finally came in, so I figured I might as well snap a few pics and show her off. Up until today I owned every variation of Good Smile's chibi styled figures, so this is my first time actually handling a Nendoroid. So with all that out of the way, pics! As an added challenge, I tried to match all the poses they have on the box. It is eerie how close the in show and real life figures are, particularly in their boxes. I also got a good laugh out of what seems to be Good Smile's tagline for the Nendoroid line, because damn it, it is so true. If you never seen a Nendoroid box up close, next to the display window, it vertically says, "Cute to look at, fun to play with and great to collect Nendoroids! ", which if you look close enough is actually on the packaging in the screen cap at the top. Of course right below that it has a warning that it isn't a toy, which made me laugh even more, because literally right above the warning it says how it is fun to play with. First up, default Miss Monochrome. Exactly as she is straight from the box. Here she is holding Ru-chan, her faithful roomba companion. Yes, she has a roomba companion, and damn it, the anime made me care for that damn roomba! I'm not even remotely kidding. Miss Monochrome is an android that runs on a single externally-housed AA battery that she puts into her battery box, as seen next to her. That battery has insane longevity, though. Miss Monochrome's preferred way to traveling around is by riding on top of Ru-chan. Forgot to mention, Ru-chan's figure actually has working tiny little wheels. It's a nice added detail, but it is a bit of a pain to get this pose done correctly(seriously, this one pose took me the most time to do....). This is Miss Monochrome doing her, well I guess you can say "famous", pose that leads right into the chorus part of the extremely catchy ending theme to the anime. This is the pose I'm actually displaying her in, mainly cause it is the only non-default one that doesn't require any of the accessories that I am neurotic about losing....also because it makes me think of the ED to the anime and I really like that ED. Dear god.....what have you done, Good Smile Company? How far does this meta joke rabbit hole go? 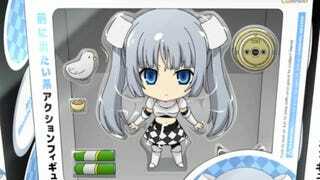 Does the Miss Monochrome Nendoroid that comes with the Miss Monochrome Nendoroid come with its own Miss Monochrome Nendoroid? And if so, does that one come with its own Miss Monochrome Nendoroid? Where does it end?! Anyways, I'm loving this figure, and I'm definitely a fan of Nendoroid figures now. Good thing, too, cause I have at least 3 more on pre-order(Satsuki Kiryuin from Kill la Kill, Iona from Arpeggio of Blue Steel(who should be the next one that arrives, btw), and Nico Yazawa from Love Live!). So yeah, that's all for now. Next time I get something interesting I'll probably do another little article like this.